Indiabulls Group, India’s leading business house with interests in Real Estate, Infrastructure, and Housing Finance has forayed into the LED lighting business. 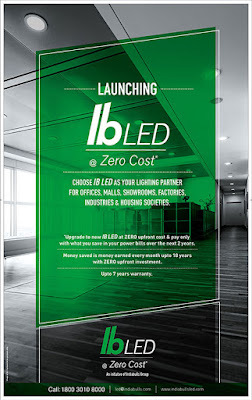 Indiabulls Group, continuing with its legacy of constantly reinventing itself, has ventured into the LED lighting business in B2B space, which is currently estimated to be at Rs 6500 Crores market in India. The new venture will be branded as “IB LED” and is getting launched to cater B2B Professional LED Lighting needs in the country. The new venture would be focusing on LED Professional Lighting for offices, malls, showrooms, factories, industries and housing societies, offering a wide range of LED lighting solutions, with up to 7 years’ warranty. Speaking about the new venture, Partha Banik, President of IB LED business, said “Indiabulls Group is one of the most dynamic and aggressive business houses in the country and has generated significant shareholder value since inception. The LED lighting business is a natural extension of what we are currently doing. We aim to be amongst the top three LED lighting companies in the country in B2B space with innovative products, solution and creating best lighting experience for our customers. IB LED will be present across all major geographies in India. We see LED Lighting business as a Service business. With an aim to ease the ‘SWITCH’ from conventional Lighting to LED Lighting, we are offering LED lighting fixtures at Zero upfront cost and pay from the savings of electricity bill over the next 2 years.